Katherine Steiner has been to IHSA National Championships plenty, but never as a competitor. 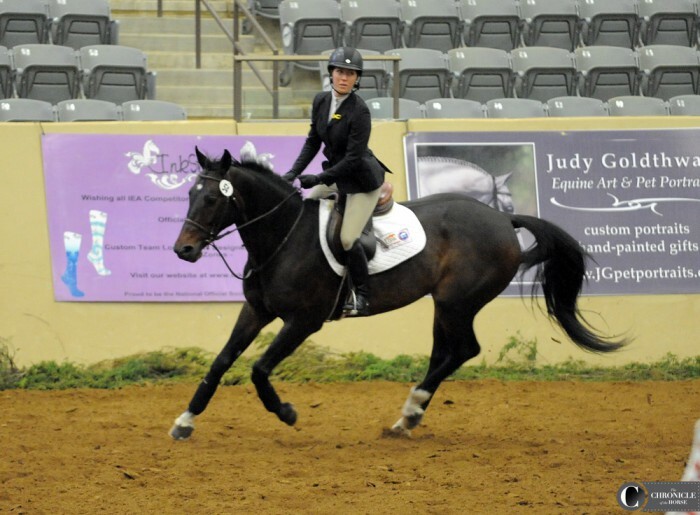 The senior spent her first three years of intercollegiate riding coming to nationals only to help her teammates and horses get ready, but this year was different. 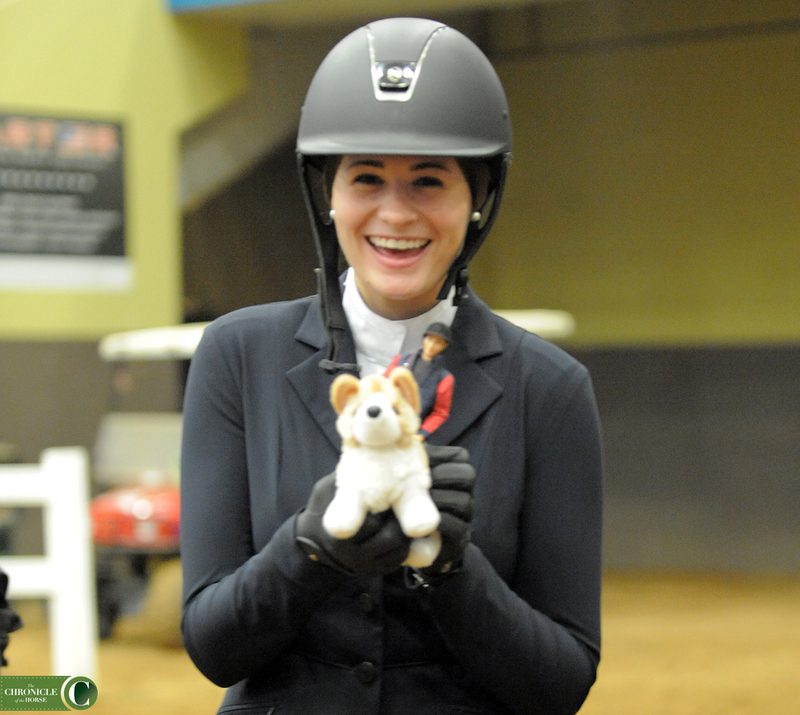 This year Steiner qualified for the Cacchione Cup open rider individual championship, and this year she’s going home with her name etched on the trophy as its 2017 winner. What makes Steiner special in Dowling’s eyes isn’t just what she does for the team in the ring. “She helps facilitate the horse shows we run, she schools the horses and helps set them up,” Dowling said. 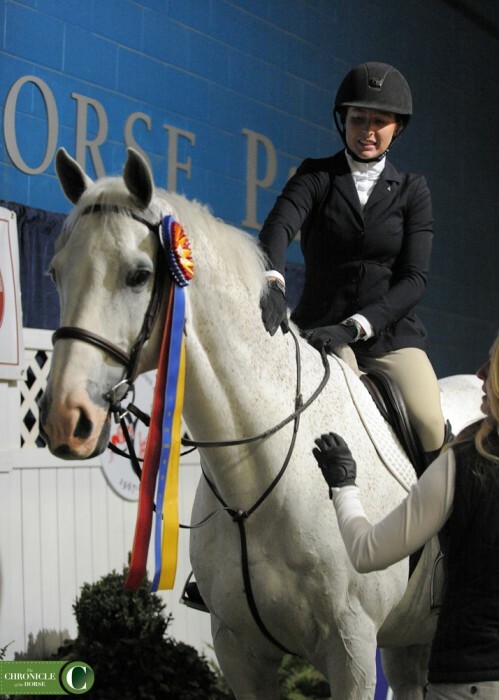 “From the day she set foot at Centenary, she has been an integral member of the IHSA team. She really dedicated herself to this. “It just makes it that much more special that she’s the person usually wiping the boots for the people going in the ring,” Dowling continued. Steiner blew her competition out of the water right from the start of the three-phase Cacchione Cup, taking the high score in the first jumping round, the flat round and finally sealing her win with a stellar test aboard E.J., a horse provided by the Savannah College of Art and Design (Ga.). Steiner was last to test, a stressful situation for the best of riders, and Steiner wasn’t even at 100 percent physically. “I’m currently Vetrapped together,” Steiner, 22, said with a laugh before the action set off a coughing spell. Steiner has come down with some sort of respiratory illness during her time at Nationals, and she wrapped her rib cage in Vetrap for support and has been using a nebulizer whenever she can. Steiner grew up in Pleasanton, Calif., competing in the hunters, equitation and hunter derbies, and her very first trainer Pam Lunny was on hand in Lexington, Ky., to witness Steiner’s Cacchione Cup win. Tatum Tatreau didn’t see her draw horse, James, go in the ring yesterday, but if she had she might be a bit apprehensive for her round in the open equitation over-fences team competition. James stopped twice at the first fence on course, a spooky vertical with rails covered in green astro-turf. That rider was given a re-ride, and James came back in the ring with a student from his Centenary University to school the fences, and it took a good bit of riding to get him confidently going over the fence. And James is just a unique guy to begin with—he doesn’t want to go with his nose tucked in; he prefers a higher head carriage with his nose poking out, and his adorable bounding stride caught more than a couple riders off guard trying to find their distances. Tatreau turned in a beautiful round on the gray gelding by letting him canter along at his own bounding pace and interfering as little as possible. The thrill of the victory wasn’t for Tatreau alone—her Savannah College of Art and Design team gained valuable points to put them in first place in the Collegiate Cup team competition. “They try to keep the points quiet from us but its impossible not to hear. I knew there was a lot of weight going in on my shoulders for this round, and I wanted to do this for the team,” Tatreau said. “We had some unfortunate rounds earlier in the week, and I know everyone’s end of the year goal is kind of resting on me right now. Tatreau graduated this spring with a degree in equine studies from SCAD, and she will now join trainer Max Amaya at Stonehenge Stables (N.J.). 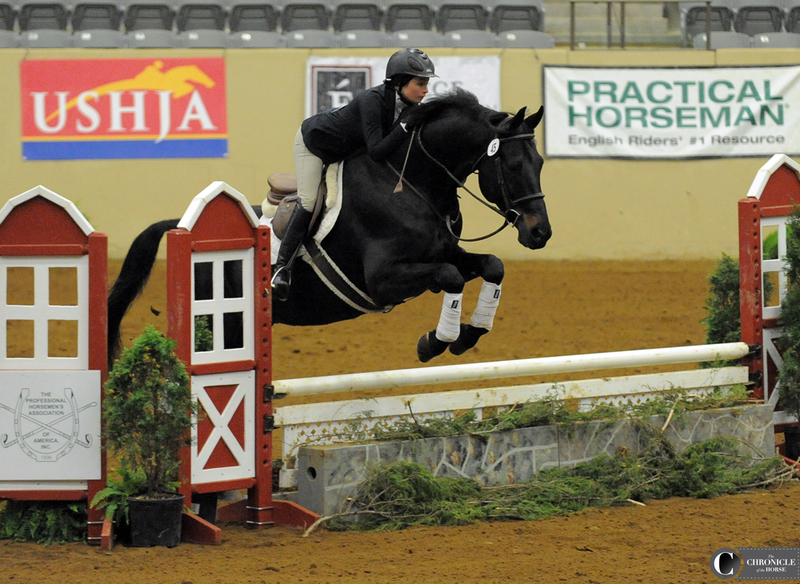 If you’re a superstitious person, luck was against Morgan Sollenberger for her ride in the alumni over fences class at IHSA National Championships. For starters, her beloved parents were at the horse show. “Every time my parents come I fall off,” Sollenberger, 24, said with a laugh. Then there was the delightful fact that her college, Emory & Henry (Va.), had a whole contingent of riders in the stands ready to cheer for Sollenberger. 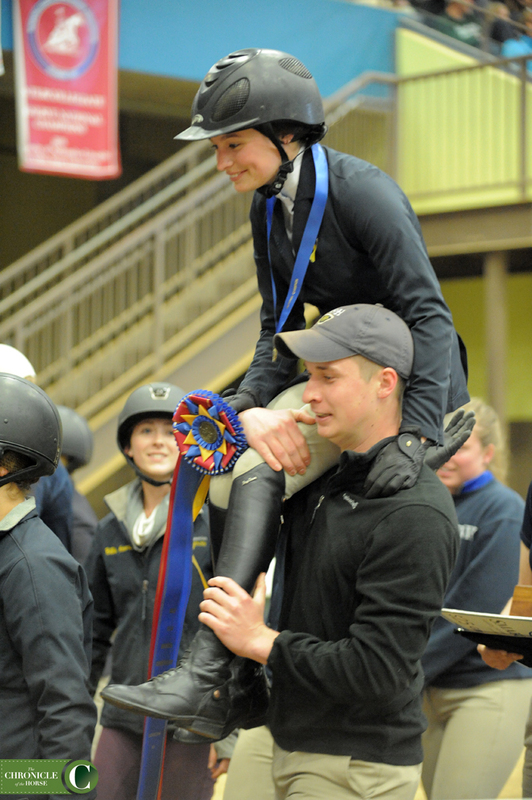 When Sollenberger won the novice equitation on the flat national championship in 2015 and the novice equitation over fences in 2016, there were hardly any Emory & Henry supporters there to cheer her on. “We don’t normally have a team here, so the first year I won it was just me and [my coach] Heather, and we were joking oh if you win it will be funny, because there will be no one there to clap for you,” Sollenberger laughed. So this year when Sollenberger beat the curse of the parents and pulled off a win in the alumni over fences class, it was a nice change of pace to have a whole gaggle of students whistling and cheering. They even lifted her up and carried her out of the ring on their shoulders. 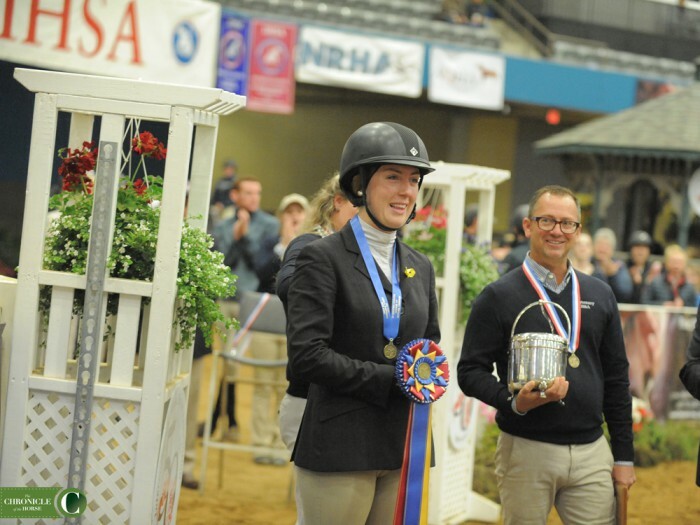 See all the IHSA Nationals results and check back with The Chronicle of the Horse for more in depth coverage from IHSA Nationals in the May 29 issue of the magazine.